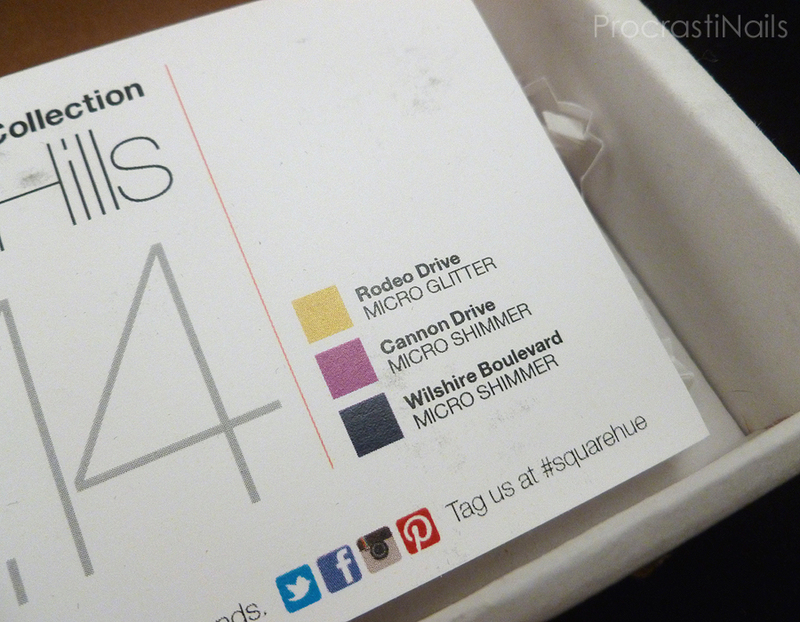 I have an exciting post to share with you today: I recently received my first box from Square Hue! 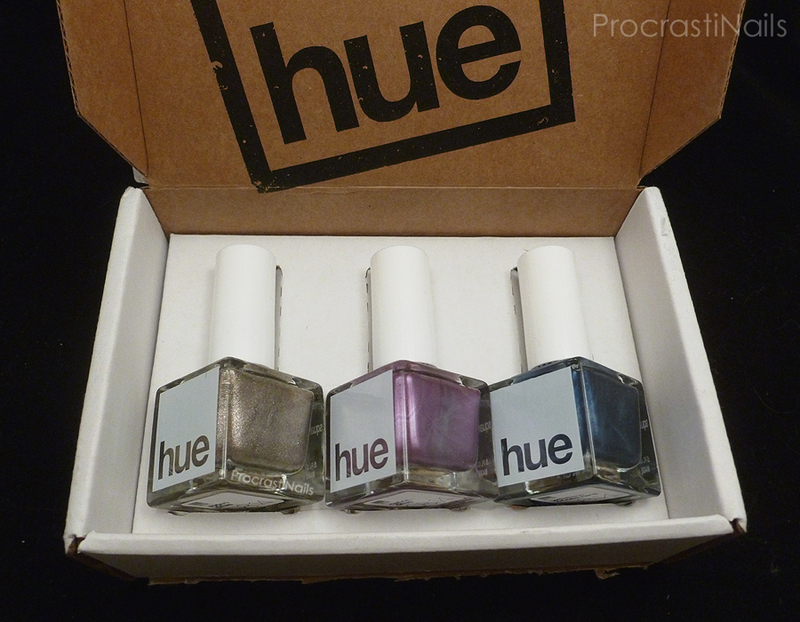 If you don't know, Square Hue is a nail polish subscription box service out of the United States that creates and sends out three new, limited edition shades each month. Their polish are 5-free (no formaldehyde, toluene, DBP, camphor or formaldehyde resin), vegan-friendly and cruelty-free. On top of that they take a portion of their sales and donate them to organizations dedicated to helping others... Their current focus is on human trafficking. So you can paint your nails and feel good about helping others while you do it! Part of what I like about this box is that you have no idea what you're going to get before it gets to you aside from the general theme. No previews! 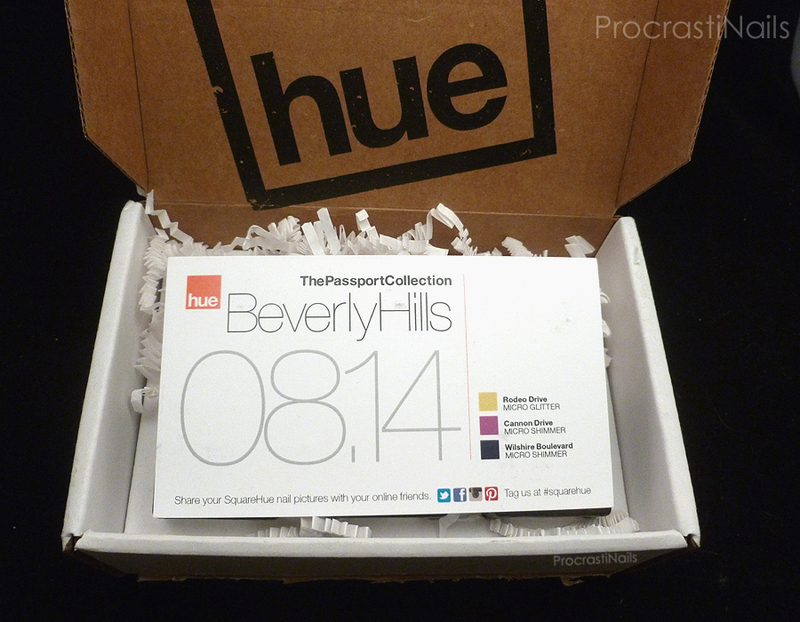 For August the theme was Beverly Hills, and it was part of The Passport Collection which is the series they've been working through in 2014. 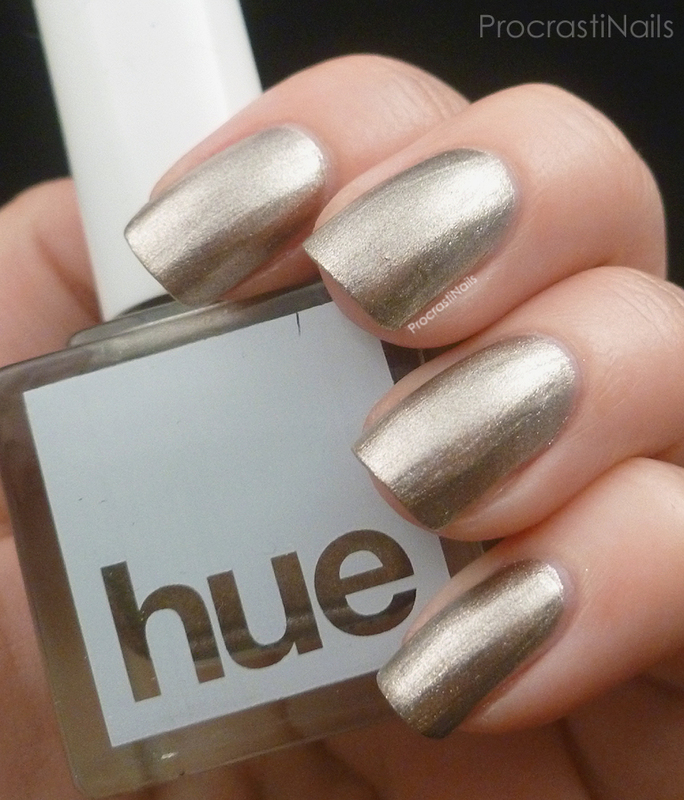 The shades this month were definitely luxe and rich, so let's take a better look! As this was a new box for me I didn't really know what to expect. Shipping was very quick - all packages are sent out the first week of the month and I received mine on August 11th. Once I opened the box I was greeted with a collection card that gave me the name of the collection and the official release date. I like that they remind you of the tag to use on social media (#squarehue), though in general I wish the card had a bit more info on it... Maybe the back could have information about the cause they're supporting, or where their inspiration came from? One thing that I thought was neat was that they have a colour legend on the card as well, telling you the colours in the box and the types of polishes they are. They said the box had a micro glitter and two micro shimmers.... Do I agree? We'll have to see! Once you remove the card you're presented with your polishes... I have to say I really like their packaging and branding! Very crisp and clean! So let's take a better look at these gorgeous shades! The first polish in this set is Rodeo Drive (which I'll be honest was the only street in this collection I'd heard about before) which is a gorgeous gold shimmery polish. It was perfectly opaque in two coats, and the consistency of the polish was great. They call this a micro glitter, but to me it's more of a foil finish... What do you think?? Cañon Drive is the second colour in this set, and while it's a soft yet striking magenta metallic I'd have to say it's my least favourite of the three. I would call this a frost rather than a shimmer, since you can see the fine particles and the way there's some visible brush stroke. Again this is a two coater, and it's one I'm curious to try with stamping! The formula was good. The last polish from this collection is definitely, hands-down my favourite. 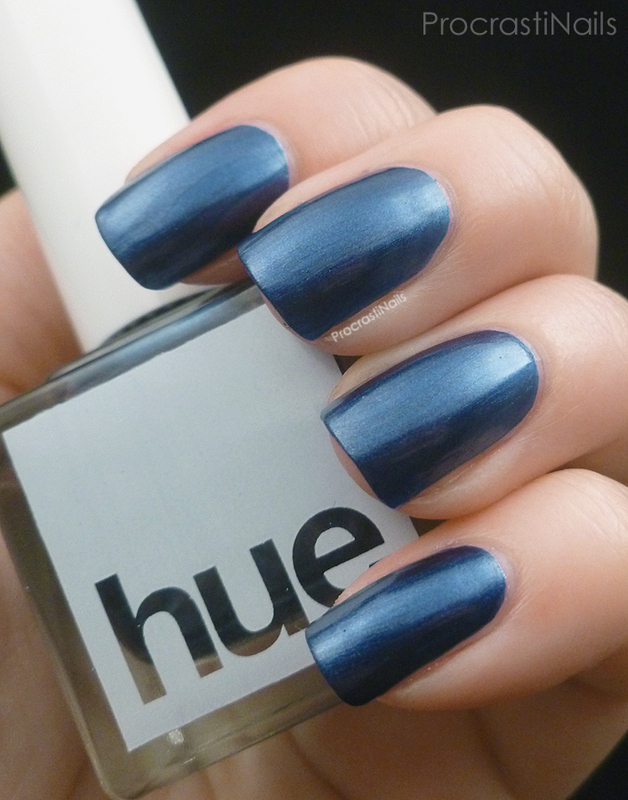 It's called Wilshire Boulevard an it's a deep, striking navy blue shimmer. Like the rest of the polishes this went on opaque with two coats and I don't have a single complaint about the formula. I love how rich and bold and pigmented this colour is... It reminds me a bit of OPI Into the Night from the Spider Man collection, but this polish is a bit deeper in colour. Cancellation/Skipping: You can cancel or skip any time just by logging into your account before the renewal for the next month (which is on the 8th). 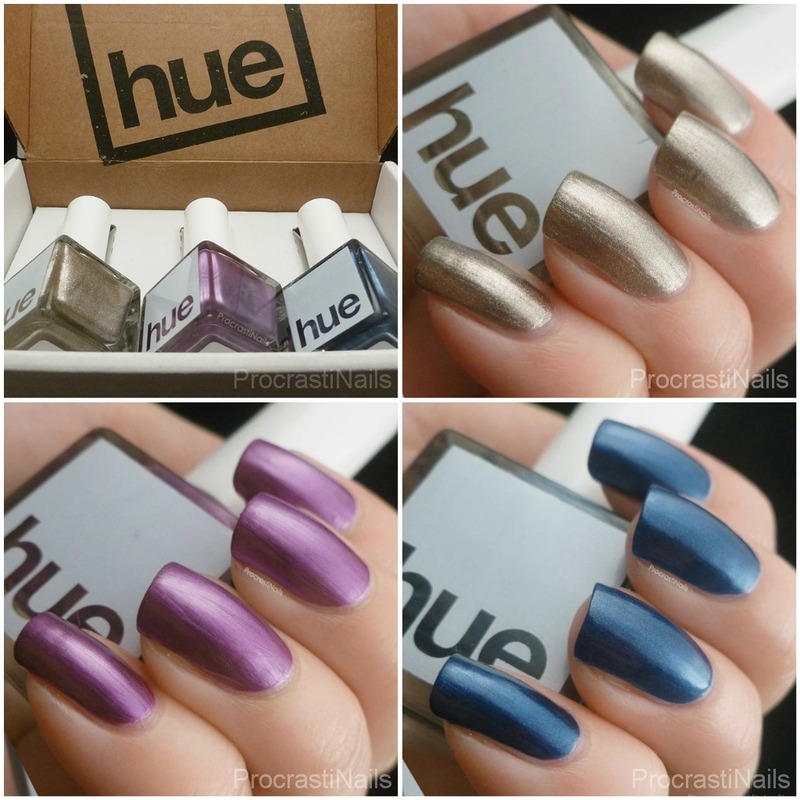 One fun thing about signing up for Square Hue now is that they have a promotion on where if you sign up for their NailMail updates you get a coupon code to use with your first order to have a surprise collection box added to your order! That being said: I used this promotion and got and input my code, and I haven't seen or heard anything about my surprise box... If I do hear anything I'll let you know. I thought this was a great set, and as I've said my favourite is absolutely Wilshire Boulevard. If you're in Canada you might notice that we have slim pickings when it comes to beauty boxes (moreso when you're looking for nail polish!) so I think Square Hue could be a great option if you don't mind surprises. I don't know if I'm completely ready to switch over to Square Hue from Julep and I definitely can't afford both each month. The theme next month is The Passport Collection: Sydney so I think I'm going to see how I like that one and then make my decision. Let me know what you think! 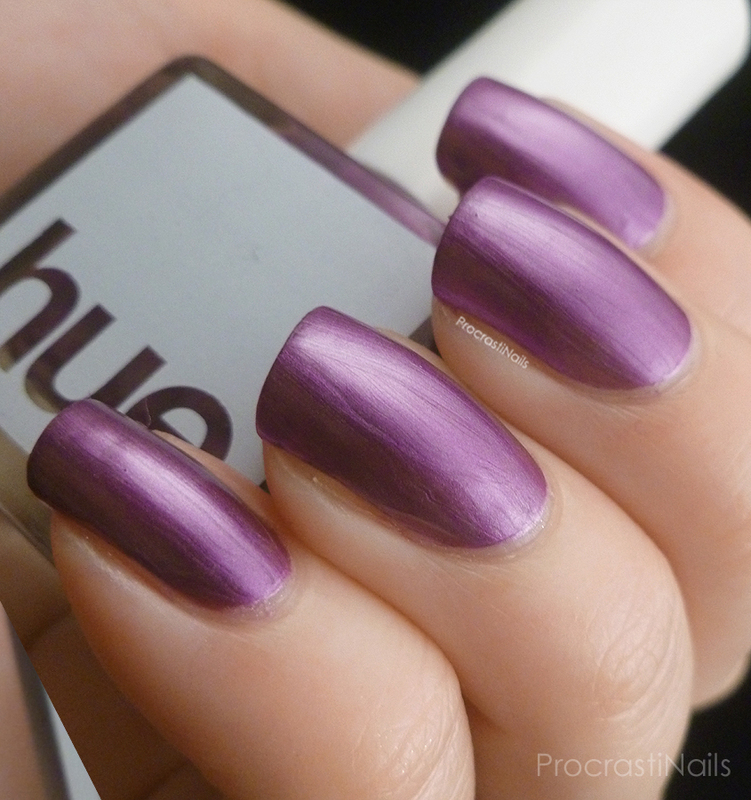 Have you ever tried Square Hue polish before? What did you think about it? Great review and swatches! I have had my SquareHue subscription on hold for awhile (I did it for a year) but I got in on the "ground floor" for $14.99 a month though. I got some really awesome boxes, some so-so boxes, and some really lame ones so I put that money into a monthly indie box now. The foil (so NOT a microglitter) and the blue look pretty great, but I don't know about that frosty shimmer... would it make a good stamper? These are nice! Really great colors for fall too. I actually really like the color of Canon Drive. Too bad it shows all those brush strokes. I think you idea about adding more information to the card about the inspiration is awesome. I love knowing how colors can to be. I agree about wanting to know more about the cause! You would think they would add some information in the boxes about it, but maybe that is too much of an added cost. I also agree that Wilshire Boulevard gorgeous, it is my favorite as well! Great review! 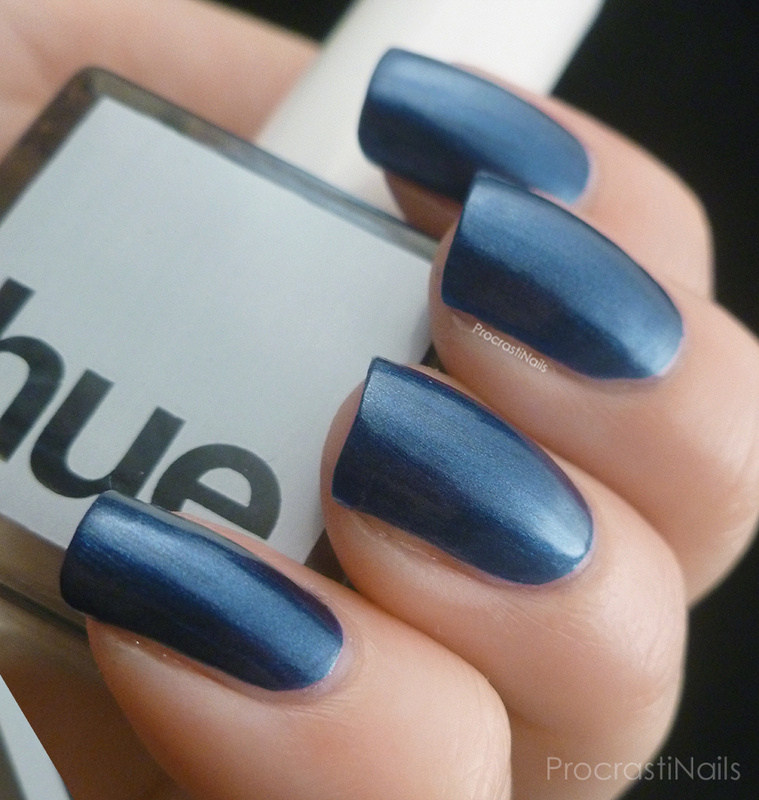 These polishes don't really seem like ones that I would use that often except for the blue, that one is gorgeous! 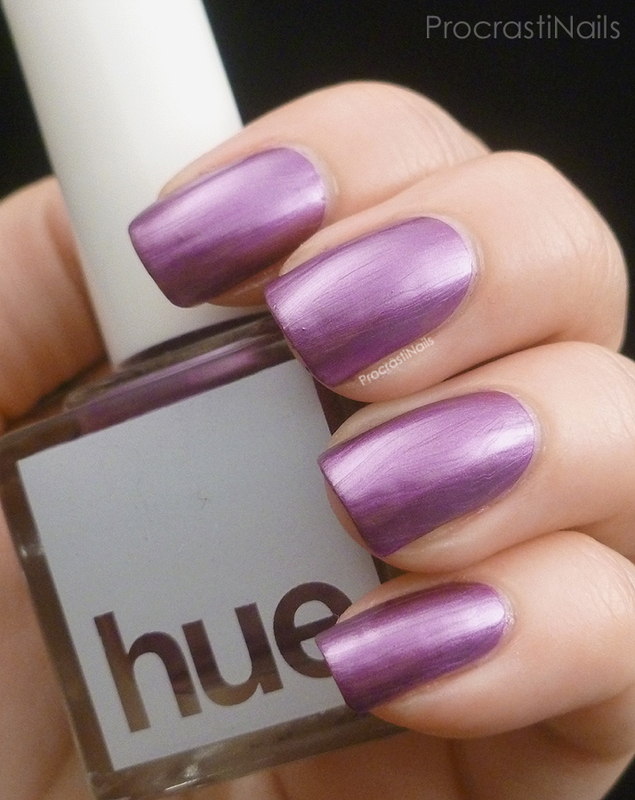 Have you heard of Luxe Lacquers before? She does a subscription box too, it's a little pricier but she offers free shipping to Canada. Maybe you'd be interested in looking into that for a new box to switch too. Rodeo Drive has to be my fave here! I like golds that aren't too yellow better. I like Rodeo Drive the best -- Canon Drive is pretty but the brush strokes kill it for me! 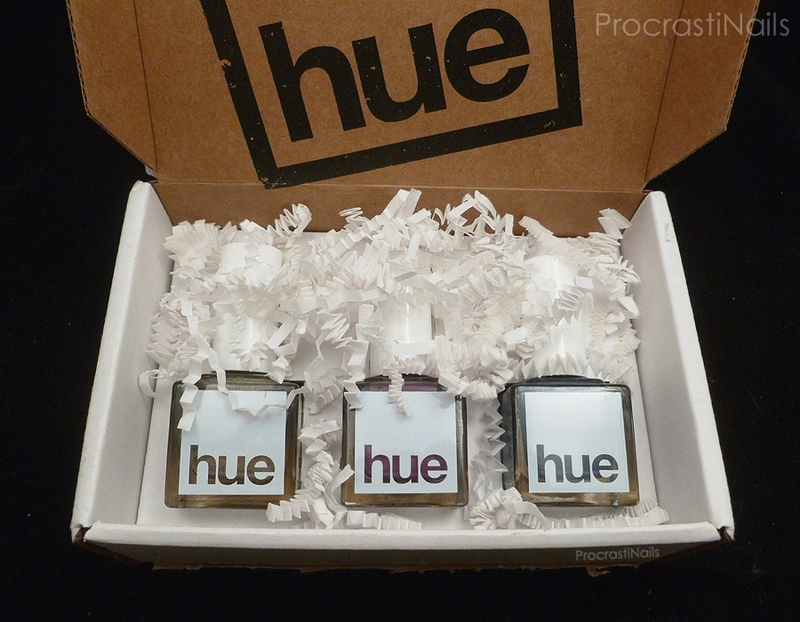 I've heard a lot of great things about Square Hue, but have never tried. That blue is beautiful! 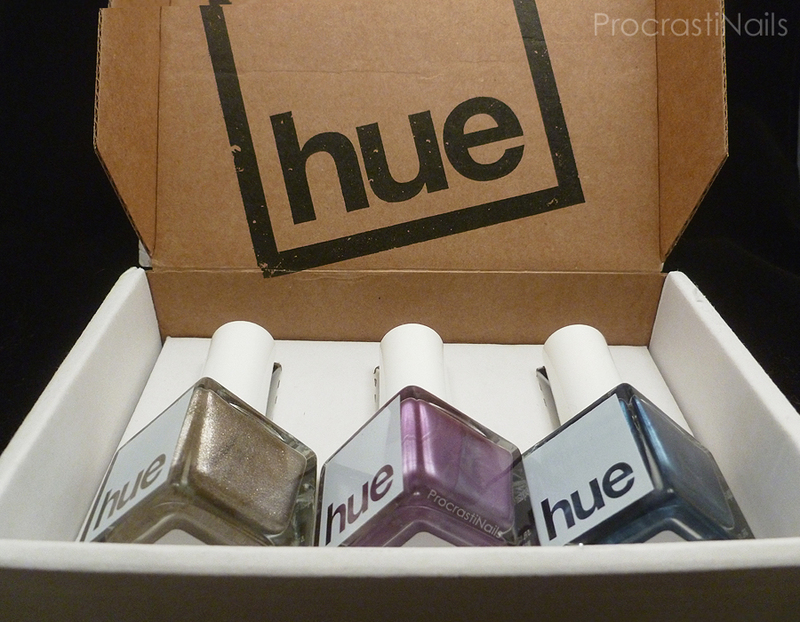 Rodeo Drive is my kinda lacquer :) I have heard of Square Hue but I'm not really into subscription boxes. I feel like I would get too many polishes that I didn't want. Great swatches! I really love the blue and the gold (and they would be so pretty together! I'll have to look into this brand because I've never tried them. I've really been pretty happy with this subscription box. I like the fact it is nicely edited, affordable, and isn't overwhelming with too many new colors each month. I have an love this box!! love this box and the finish on these polishes!